Geoff Smart had some doubts. He saw what you see – how broken government has become. He worried about his career, his family’s future and our everyday quality of life. Thomas Paine’s Common Sense painted a vision that inspired a generation and changed the course of human history. The movement of our time is leadocracy government by society’s greatest leaders. Leaders like you. 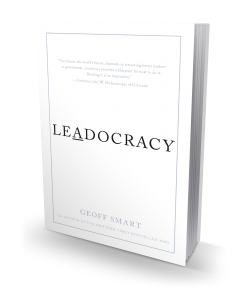 Geoff Smart is a CEO, bestselling author, and social entrepreneur whose mission is to create, communicate, and put into practice useful ideas about leadership. 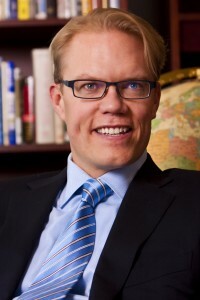 Geoff is co-author, with his colleague Randy Street, of the New York Times bestselling book Who: The A Method for Hiring. The book is one of the bestselling and most-acclaimed books in the world on the topic of hiring leaders, which The Wall Street Journal calls “the most important aspect of business.” Soundview Executive Book Summaries gave Who the “Best 30 Business Books Award.” Shanghai Daily named it a “Top 5 Business Book in China.” Canada’s Globe and Mail named Who the “#1 Best Business and Management Book of 2009.” Geoff is also co-creator of the Topgrading® philosophy of talent management. As a social entrepreneur, Geoff is Chairman and Co-founder of SMARTKids Leadership ProgramTM, a 501c3 not-for-profit foundation. It provides a customized program of 10 years of leadership mentoring and a $100,000 scholarship to top students with leadership potential from low-income communities. He is Chairman and Founder of THE LEADERS INITIATIVE, whose mission is to elevate humanity by identifying, developing, and deploying society’s greatest leaders into government. Geoff and his ghSMART colleagues also provide pro bono leadership advisory services to leaders in the fields of education, healthcare and government. Geoff earned a B.A. in Economics with Honors from Northwestern University, an M.A., and a Ph.D. in Psychology with emphasis in Leadership from Claremont Graduate University, where he was a student of Peter F. Drucker. He was elected to Sigma Xi, the honorary society for holders of doctoral degrees, and is a member of Young Presidents Organization (YPO).